Distant are the days of Annie Hall, when Woody Allen resigned himself to a plate of alfalfa sprouts and mashed yeast. Over the years, vegan eating has gone from tasteless to trendy to making inroads into the mainstream. One sign of the times: in 2016, Tyson Foods, the largest meat processor in the United States, bought a 5 percent stake in the plant-based protein producer Beyond Meat. (The company’s best-known product, the Beyond Burger, is pinkened with beet extracts and reportedly sizzles when grilled.) No longer fettered by associations with hippie kooks or radical politics, veganism has ascended to the astral plane of aspirational living. These days it keeps mixed, and more glamorous, company: famous bodies belonging to the likes of Tom Brady and Beyoncé have been fueled by vegan diets. Sociology graduate student Nina Gheihman is researching social aspects of veganism’s spread. Veganism was at first closely bound to the ideology of the animal-rights movement, she explains, which initially aimed at a range of targets, like wearing fur and testing products on animals. Once activists shifted focus to farm conditions and food, veganism took on the features of what scholars call a “lifestyle movement.” Over time, it’s become more closely associated with general environmental concerns and a “healthism” mentality, bound up with notions of perfecting the body. Trustworthy numbers on how many people identify as vegan are hard to come by, says Gheihman, but a growing number practice veganism in some way: incorporating meat and dairy substitutes in their meals, or restricting their diets at certain times of day or for a period of weeks. Social scientists have studied veganism as it relates to animal-rights activism, but there’s been less research into the current lifestyle movement’s mechanisms and structure. Gheihman is especially interested in analyzing leading figures whom she’s provisionally termed “lifestyle advocates,” arguing that they have changed the nature of lifestyle activism. They usually come from fields not typically associated with activism, she says, especially entrepreneurship—and the “cultural work” they do isn’t strictly defined by their official occupations. This work has expanded veganism beyond its ideological core, enabling a greater variety of people to participate even if they don’t conform all aspects of their lives to all its tenets. Gheihman plans to conduct field research and interviews to examine the evolution of veganism in two other national contexts. The first is France, “the obvious place to study a food movement, because it is so central to the notions we have around what makes good food, or proper food.” The country’s cuisine might seem inimical to cashew cheese, or chickpea runoff (called “aquafaba”) as an egg-white substitute, but the hierarchical structure of its food culture could pave the way for dramatic change. In recent years, haute cuisine chefs, catering to a high-end international clientele, have had to experiment with vegan menus and pastry-making. 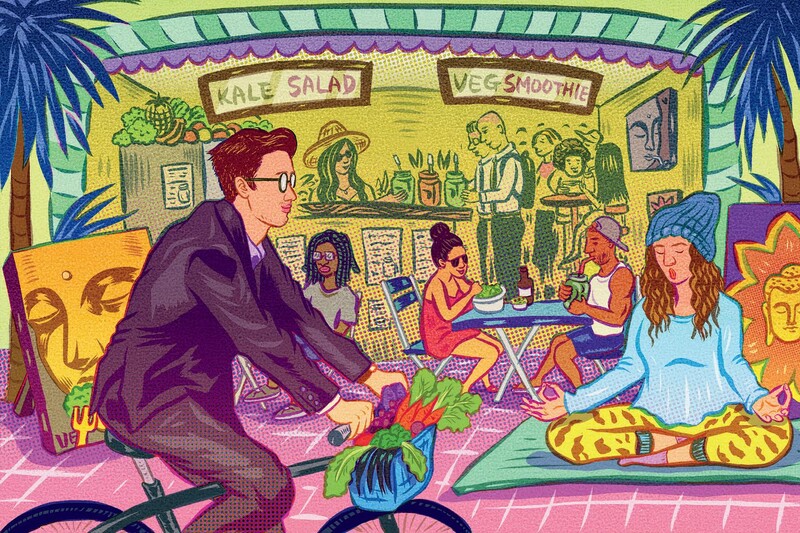 Their trickle-down influence has been amplified by a network of vegan food blogs and cookbook writers—even as other institutions resist the spread of this lifestyle. The French ministry of health, Gheihman points out, warns that following a régime végétalien will result in nutritional deficiencies and long-term health risks, and the government’s nutritional standards for school cafeterias mandate a dairy product with every meal. The second case is Israel, where by some estimates, nearly 5 percent of the population is vegan; Tel Aviv has earned a reputation as one of the vegan capitals of the world. The Israeli Defense Force even provides animal-free menus in mess halls, and leather-free boots and helmets to vegan soldiers. But beyond the numbers, Israel provides an interesting contrasting example, Gheihman explains, in part because veganism there remains firmly rooted in animal-rights concerns, and is practiced across the political and the religious spectrum. She is also interested in how the vegan lifestyle has evolved within Israel’s cultural context, undergirded by national symbolism surrounding land and water usage, and informed by the country’s farming traditions and Mediterranean diet. Gheihman’s own vegan lifestyle, meanwhile, reaches well beyond the radius of her individual plate. She’s involved with the Council for Sustainability, the Harvard Vegan Society, the Ivy League Vegan Conference, and the Boston Plant-Based Millennials, which hosts monthly potlucks. “There’s one this Sunday, actually,” she adds, not quite casually.